Emmanuel Mofammere, Boitumelo Simela and Charmaine Phoofolo have been working towards this month all year long – 23 October marked the official start of the 2017 matric final exams and the three Free State based pupils believe that achieving in this exam will open the doors to a bright future. By PUSELETSO NTHATE. Emmanuel Mofammere, 19, has spent the past few months living in a classroom at Lenyora la Thuto Comprehensive School in Botshabelo, Free State. Each morning before his classmates arrive, he rolls up his sleeping gear, stores them neatly away and readies himself for the day’s lessons. Emmanuel and a few of his friends gave up the creature comforts of home and convinced the school’s headmaster to let them set up a camp at school so that they could have more time to revise for their final exams. Photo: Emmanuel Mofammere at school. Photo: Willem van der Berg. “We used to go home at around 6pm, limiting the time we had for studying and leaving that late was a bit risky,” he said. “We needed more time and that’s when we approached the principal and pitched the idea,” said Emmanuel, who has an academic average of 90%. The principal of Lenyora la Thuto Comprehensive Secondary School, Talla Modupe said he was a bit sceptical when the boys approached him with the camp idea. “I didn’t want them to be sleeping here, boys and girls mixed together, but when teachers came on board to assist I was relieved and allowed girls to join the camp,” said Modupe. “With this camp, we were hoping to help ourselves and our fellow learners to stay on track and get the results they want at the end of the year,” explained Emmanuel. Emmanuel, who was adopted shortly after his mother died when he was 10 years old, wants to be an astrophysicist. He has applied to Wits and Cape Town universities to study further. The pupils sleep at school from Monday to Friday. Several teachers have volunteered to assist the pupils helping them with revision and preparing meals for them. Photo: The area where the pupils have set up camp. Photo: Willem van der Berg. “I had to talk to the School Governing Body (SGB) to help with supper and lunch. It’s not the best food but it’s enough to make sure they don’t go to bed hungry,” said Modupe, adding that he was willing to do anything his power to see these pupils pass their matric. Modupe said in all the years that he’s taught, he has never seen a more disciplined and focused person than Emmanuel. “He is one of the best pupils, each and every term he gets an achiever award. He always performs at level 7, when he says he failed that is because he dropped one level down to level 6. “What I like about him is that he is not selfish, he is always willing to help his fellow learners and he is a humble person,” added Modupe. 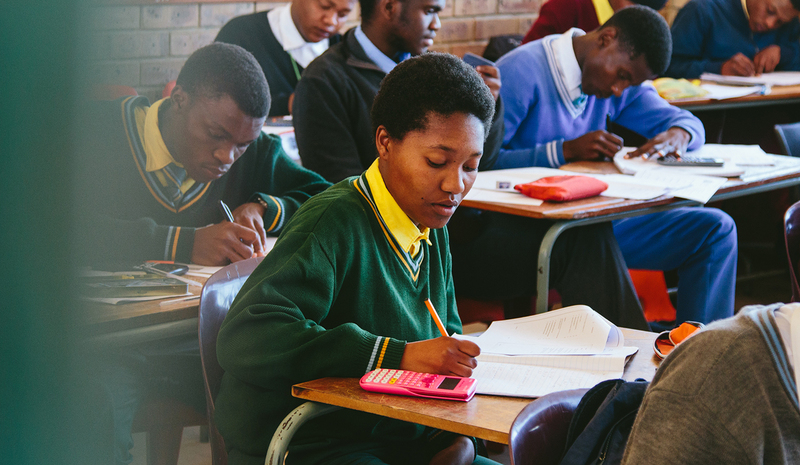 The Lenyora la Thuto Comprehensive Secondary school produced a 74.1% pass rate in 2016 with 55% in mathematics and 63% in physical science. Boitumelo Simela, an 18-year-old pupil at Beacon Secondary School, has dreams of becoming a mechanical engineer. “My father is a taxi driver and his income and my younger brothers’ grant money is our only source of income at home… I want to excel in my studies so that I can provide my family with a better life that I know they deserve,” Boitumelo says. Photo: Boitumelo Simela and her father Lesole Simela. Photo: Willem van der Berg. The top pupil at the school, Boitumelo draws inspiration from her father, a self-taught mechanic. “Sometimes we spend half the night changing brake pads, adjusting the alignments and fixing the wiring of a car together,” added Boitumelo who admits that despite this, her father still thinks her career choice is man’s job. “But if I, a random poor village girl, can get 90% and more in my subjects, it (a B Sc in Mechanical Engineering) is most definitely possible,” she says. Watching her mother die of lung cancer while waiting for treatment when she was in Grade 6 is what drives Charmaine Phoofolo. Photo: Charmaine Phoofolo wants to become a medical doctor. Photo: Willem van der Berg. “There was a time when my mother had complications and we called an ambulance and when we got to the hospital we could not get the assistance she required because there were no doctors to help,” Charmaine recalls. “I don’t want to see other people losing their loved ones because they couldn’t get the help they need in time,” the shy 19-year-old, who wants to study medicine next year, said. “My mother was on a waiting list to see a specialist who could assist her with her condition but unfortunately she died before that could even happen,” said Charmaine. Charmaine sees herself working in a public hospital and assisting people with the best medical care they need. “I believe if it was a private hospital my mother would have had the assistance in time because it would have been paid for. Photo: Charmaine Phoofolo revises ahead of the start of the 2017 matric examinations. Her mother died from lung cancer while she was waiting to see a specialist at a state hospital. Charmaine was in Grade 6 at the time. Photo: Willem van der Berg.